Hooking up an Xbox 360 to your TV is a fairly straightforward process. With the proper cables from your Xbox and the right ports on your TV, you can start playing Xbox 360 games on your big screen in no time. There are two types of cables that can be used when connecting an Xbox 360 to a TV: HDMI and A/V cables. However, not all Xbox 360 models have the older A/V port, and not all TVs have an HDMI port. Before getting started, choose a good place to set your Xbox 360. You want it to be accessible but also in a well-ventilated area that's free of dust. Too much dust and your Xbox can overheat. Both the original Xbox 360 and the Xbox 360 S can use A/V cables or HDMI to connect the console to a TV, but the Xbox 360 E relies on HDMI only. Therefore, it's important to see what your TV or monitor supports so that you can determine the cable you need. For example, to connect an Xbox 360 to an older TV that isn't HD and doesn't have an HDMI port, you might need to use the Xbox 360 VGA HD AV cable which converts the A/V port into one that can connect to a VGA port. Or, if you have an HDTV with an HDMI port, you can use a standard HDMI cable to connect the console to the TV. Look at the back of the Xbox and the side or back of the TV to see what's needed to make the connection work. Now it's time to connect the appropriate cable from the Xbox to the TV. If you've chosen the correct cable for audio and video, you should have no problem establishing a connection. VGA HD AV: Plug the larger end into the Xbox and the other end (the VGA for video and the red/white cables for audio) into the TV. Match up the red and white cables with the red and white ports on the TV. HDMI: Connect both ends to the USB-looking ports on the Xbox and the TV. Both audio and video are carried on the same cable. Composite AV: Attach the bigger end to the Xbox and the other three cables to the matching colored ports on the TV. Component HD AV: Connect the large plug to your Xbox and then match the red/green/blue video cables with the same port colors on your TV. Also connect the red and white audio cables from the other set on that same cable. Not all TVs look like the one pictured above. Older TVs have the A/V ports but not HDMI, and some newer ones might not have a VGA option. If, and only if, you have an HDTV and want to use your Xbox 360 in 480p, 720p, or 1080i resolutions, you have to slide a little switch over on your A/V cable. The original model Xbox 360 had a combination component/composite cable and you had to use this switch on the cable to choose between them. Later models of the Xbox 360 came with only a composite cable, so this step likely isn't necessary if you have a newer model. Some systems also came with an HDMI cable, which is what we recommend you use now. Now that you have the audio/video cables connected, the next step is to hook up the power supply. Connect the two parts as shown in the picture and then connect the "power brick" end to your Xbox 360 and the other end to a wall outlet. The big power brick needs plenty of ventilation just like the main system, so try to have an open space on a shelf for it. It's not recommended that you set it on carpet. Microsoft recommends that you connect the power supply directly to a wall outlet and not to run it through a power strip or surge protector. 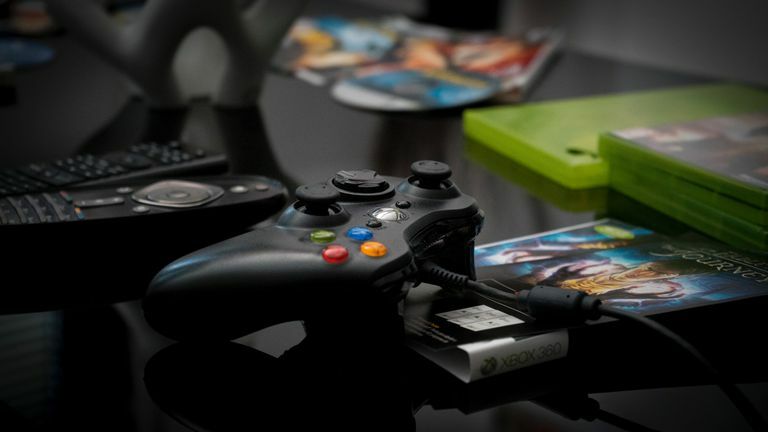 A power strip or surge protector doesn't always deliver a 100 percent consistent supply of power to the system, and the fluctuating power flow can actually damage your Xbox 360. Once you have everything hooked up, you're ready to go. Press the large circular power button on the Xbox 360 to get things started. If you have a wireless controller, hold down the guide button to turn it on. If you have a wired controller, plug it into a USB port behind the little USB door, and you're set. Press and release the connect button on the controller. The light surrounding the Xbox's power button will stop flashing to indicate that the controller is connected to the console. If this is the first time the system has been used, you'll have to go through an on-screen setup process. This is simply setting up your player profile, choosing HDTV settings if available, and/or signing up for Xbox Live service. The system walks you through everything.